ICTO provides Follow-You Printing Service to students. Students can print documents with computers in all ICTO computer rooms, fast access computers and notebook computers issued on loan. In addition to these methods, students can also use MobilePrint and WebPrint services to print from their own mobile devices and laptops. MobilePrint and WebPrint are fully integrated with Follow-You Student Printing. 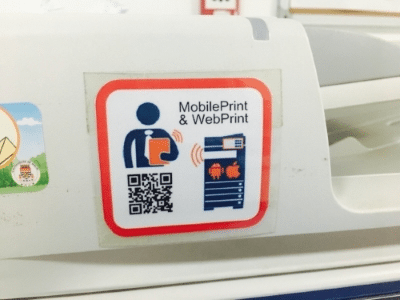 They allow students to print from mobile devices (Android/iOS 7.0 or latest) and web browser to the supported printing devices via the UM network. Currently, there are 17 printers support MobilePrint & WebPrint services at ICTO computer rooms and Library with the following logo. The file formats that can be printed via MobilePrint & WebPrint are: Microsoft Office, PDF, JPE, JPEG and PNG. The costs are same as Follow-You Printing Service. To use MobilePrint service, your mobile device is required to connect to UM wireless network and install the mobile App “EveryonePrint”. Once setup, students can submit print job by this mobile App or by AirPrint (iOS only) to those printers on campus. Student can download the App from App Store or Google Play by searching “EveryonePrint” or scan the below QR Code. To configure the MobilePrint App, please read the setup guide ( iOS / Android ) of MobilePrint. Please note that MobilePrint may not allow you to specify printing options, like changing paper size, limiting to specific pages and printing multiple pages per sheet. For detail information, please visit the FAQ of MobilePrint service. WebPrint provides a web portal for students to upload the file(s) for printing via UM network. Students can submit print jobs from any PC, laptop or mobile device by uploading it to the WebPrint web portal using web browser. To print with WebPrint, please access the following link and sign in with your UMPASS.